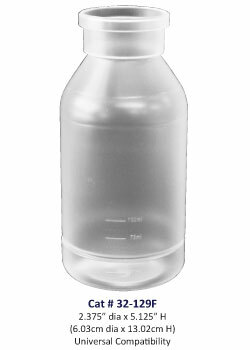 These reusable plastic stock bottles are available in transparent autoclavable polypropylene or less transparent non-autoclavable polyethylene. Also, they are available with two distinctive openings: one is compatible with paper lids; and the other with Flugs, Buzz Plugs (a trade mark of Fisher Scientific), and paper lids. These hard-to-find (milk-style) bottles are made of rugged heavy wall glass, which will withstand numerous autoclavings. We also offer previously owned bottles (when available). These used bottles may have a few scratches on them, but they’re very clean and they will last for years. And they can be bought at substantial savings.